These were interesting times for Robert Fripp, ye olde scholastic of the progressive rock scene. In 1978 he had released Exposure, an album that he described as "A Day in the Life" for that period. He had also explored punk and new wave with the League of Gentlemen, a band that featured ex-XTC keyboardist Barry Andrews and eventual B-52s bassist Sara Lee. He then put together an ensemble of Talking Heads guitarist Adrian Belew, bassist Tony Levin whose credits spanned from Peter Gabriel to Paul Simon to Chuck Mangione, and old colleague Bill Bruford. 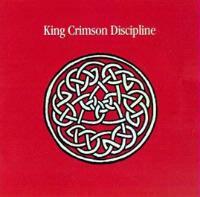 The band originally called itself Discipline, but Fripp is reported to have said that "The music is so good that there can be only one name for it: King Crimson." This was not your father's (or your older brother's) King Crimson. Gone were the mellotrons and layered arrangements, and "sounds better with black lights" lyrics. The King Crimson of 1981 was lean, mean, and hideously polyrhythmic. The resultant album, Discipline, is considered by many to be the best of the Fripp-Bruford-Belew-Levin quartet. The two-guitars-bass-drums instrumentation had never been pushed so far before and may not have been pushed so far since. The end result is an album that sounds as though it could have been recorded in 2005 and not 1981. Belew spits out an alliterative list of words for verbal communication as Levin lays down a funky back beat. Bruford's use of the boo-bams (small tom-toms - he was pretty much getting away from the hi-hat at that time) keeps the song bouncing as well. The guitar solos are - what else? - elephant noises. While Fripp lays down a lightning-fast arpeggio (all those hours in front of the TV practicing those cross-picking patterns really did pay off! ), Belew employs a variety of gadgets and techniques to counter. Bruford's eighth-beat-behind-the-four snare is what puts the song over the top, though. The band relaxes on this piece, employing a gentle, 12/8 feel. Fripp offers a languid solo, and Belew's vocals are crystal-clear. Originally a springboard for some "erratic drumming" (by Bruford's own admission), the song explodes into a bombastic 5/4 riff with Fripp offering a controlled-yet-atonal solo, that is alleviated by Belew's lyrics, nothing more than excerpts from a letter his then-wife wrote him about a painting she did. Levin's Chapman Stick keeps the tension as does the hammer-on pull-off guitar. The piece is as intense as anything in the Crimson catalogue. Fripp had done some "vocal concrete" with NYC, taping an argument outside his apartment and building a song around that, so the idea wasn't new to him. The vocals are mainly tapes of a robbery victim, and Belew then encountering some street thugs, while Belew maintains the sense of chaos with some brilliantly controlled feedback. Bruford again uses the boo-bams to keep a bouncing beat, and Levin, on the other hand, keeps the simplest of bass riffs going, but why say more when you don't have to? The band gets a bit ethereal here, but after the chaos of the previous two songs, it's what Frank Zappa might call "Blessed Relief." Bruford employs a tongue drum (you've seen 'em - those wooden boxes with the grooves cut in them and, played with a mallet, the different tongues make different pitched sounds), and Levin prowls the ocean floor of the bass. Fripp states the first theme on guitar where he incorporates a short solo, then Belew comes in. His guitar sounds more like a synthesizer than a guitar. The chords are lengthy and rich, and Fripp then takes a solo of Belew's chordal pattern. Fripp then restates the themem and the piece drifts off to the biosphere. The one is both relaxing yet demanding, but it is an aural exploration that never fails to leave the listener impressed. I like to think that I can figure out a strange time signature - 9s, 11s, 13s, and so on. I never could figure this one out on my own - I think I read where parts of it were in 17/16, not something you can usually suss out on your own. The mandala-like interplay of Belew and Fripp, along with Bruford and Levin's anchoring of the piece, is nothing short of outstanding. This is music not made by mere mortals, but by four musicians whose limits apparently don't exist.